1. I just reread last week's list, and it seriously has to be the most boring blog post on the planet. What made me think I had enough thoughts for a list? Not sure. 2. I haven't watched the Academy Awards in years, largely because it's not nearly as enjoyable to me if I haven't seen any of the films nominated, and the past several years I either just haven't gone to the movies as much or the films nominated just haven't been that appealing to me for whatever reason. This year is actually the first year in a while that, when I saw previews for the movies nominated I actually wish I'd seen quite a few of them (not just Best Picture nominees, but films with nominations in other categories as well). Of course this year, I kind of wish I'd watched the Oscars because it appeared that there were some entertaining and enjoyable moments -- some intended, and some not. 3. I must have movies on the brain, because Friday night I actually watched one! It was a movie called Man Up, starring Simon Pegg, and really quite delightful. The premise: Fresh off of a terrible engagement party and ill-fated set up, and on her way to her parents' 40th wedding anniversary, Nancy is mistaken for Jack's blind date. Nancy goes along with it, and the two have a great date...until Jack realizes she's not who he thought she was. Anyway, I love Simon Pegg and the rest of the cast was great too. If you're in the mood for a funny romantic drama, it's a good one. Especially if you have a soft spot for Brits. 4. Finished the book Also Known As last week. It's young adult fiction, about Maggie, a teenage girl who's family are spies in a secret non-government spy agency. Maggie is prodigy safe cracker, and primarily helps out on her parents' missions, but finally gets a chance at her own job when The Collective wants her to befriend a high school boy in order to hack into his father's home office safe and computer. It's fun and witty and sweet. Nothing earth shattering, and while I may read the sequel, I'm not in a rush to get it. 5. I've entered into the part of my half marathon training where I'm doing weekly long runs that are longer distances than I've run in at least 3 years. So every week is a new-again milestone. This week was especially great because I set out with a minimum goal of 5 miles, but an if-I'm-feeling-it goal of 6 (the two goals are because my last long run was cut short since I'd been sick just a few days before). Well, I ran 6.18 miles. Yay! Just what I needed. My last couple of runs had just felt really hard, so it was nice to feel in the zone. 1. I'm re-watching Freaks and Geeks on Netflix right now, and I keep forgetting how many now-famous people are in that show (perhaps they were famous then too? Not to me, at least). Yesterday, I saw an episode with Matt Czuchry AND Shia LaBouf. 2. I don't wear much jewelry these days since I'm not going out to a job every day, so the past year or two I've basically developed a rotation of a few of my favorite things. A few pairs of earrings and a few necklaces. I'll mix it up now and then when I have reason to accessorize, but when I travel especially, I tend to take just a few things. Well. That backfired. Because somehow either in the last leg of our trip home in January from Winter Travel Extraveganza, or in unpacking chaos, I have lost my absolute favorite pair of earrings and one of my three favorite necklaces. The earrings are more replaceable -- I bought them myself, and I know where to get another pair. Just have to give myself permission to spend the money again. But the necklace was a gift from my friend Katie who lives in Phoenix. So not only did I love it because it was cute and trendy and went with literally everything, it had sentimental value as well. Are these big problems in the grand scheme of things? No. But it's still a bummer. I'm still hoping they'll turn up somewhere in my house eventually. 3. Vacation is almost a month away now and I still feel very unprepared. Part of that is that it's Monday. On Mondays I either feel like I'm stuck in a sinkhole with a pile of things to do on top of me, or I feel like a productive superwoman. Today is option A. But it'll get done. 4. Just started learning a new game yesterday: Tak. A game that appears in Patrick Rothfuss's Name of the Wind, and one that a game designer decided to create. It's really great. Simple, but complex. 5. Went for a run in my neighborhood yesterday and almost ran into a skunk. I'm sorry, what? Thankfully it stayed on its own side of the street. It's been a while since I read a book by Kate Elliott, and after finally sitting down with Court of Fives I'm kind of kicking myself for putting it off so long (so long, in fact, that I remember adding this to my mental to-read list back when it first came out....in 2015). 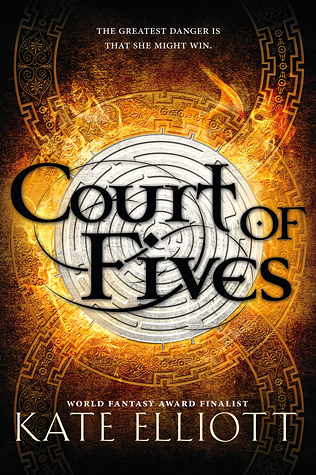 Court of Fives is the first in a young adult fantasy series set in an East Asian and Pacific Island- inspired fantasy world. Jessamy is one of five daughters, in a family that is both highly regarded and looked down upon. Her father is Patron-born, and a decorated Captain in the military. Her mother is Efean, a "commoner." It is illegal for Patrons and Commoners to marry, and Jessamy and her sisters are seen as disgraceful. Not only are they girls -- highly honored in Efean cutlure, but looked down upon in the Suro (Patron) culture -- they are "mules." But Jessamy's father loves her mother and their daughters and cares for them and protects them as best he can. Jessamy has one goal in life -- to play the Fives, an athletic competition that combines strength, speed, balance, strategy, and mental sharpness. She trains in secret, but dreams of one day being able to compete. When disaster falls upon her family, it's her skill at Fives that ends up saving herself, her mother, and her sisters. It's this skill and passion that introduces her to Kalliarkos, a Patron of extremely high standing, with whom she forms a friendship, despite unanimous disaproval. Now, Jess is caught up in political schemes beyond her control, a pawn in games she isn't even aware of. And it's through this turn of events that she begins to get glimpses into the history of her mother's people, glimpses that lead her to believe that maybe the history she's been told isn't exactly the whole truth. My enjoyment of Court of Fives can be summed up like this: I immediately bought the second book once I finished it. Kate Elliott builds the most amazing worlds, and it's always fun and interesting and exciting to spend time in them. Her plots are layered and detailed, and I really enjoyed the complex -- i.e., interesting and realistic -- relationships between the various characters. Jess is a bit exasperating at times, but who isn't? 1. Just started reading The Court of Fives by Kate Elliott. Pacific rim- inspired fantasy fiction and so far I'm digging it. 2. It's officially training time for the Oklahoma City Memorial Half Marathon! It's been a few years since I've trained for anything, and I'm excited. Slightly apprehensive since there are a lot more things to factor in when scheduling my time, but my goal is just to finish, so the bar isn't set too high. 4. ...my quest lately to find a consistent and reliable way of consuming news. I don't actually want to rely on Facebook and Twitter headlines. But again...it takes a change in my reading habits that just hasn't happened yet. But I think these days with so much news and opinion and information (and misinformation) flying around, I'd be better off being at least semi-well informed. But, I've never been a news junkie and have no desire to be. I guess I want to consume news in the most efficient way possible, and not let it consume my time. 5. I've been trying kombucha recently and I like it! In a perfect world I might even brew my own, and while the little bit I've read about it makes it seem easy -- or at least, not hard -- it just seems like one more thing to start and keep up with, and maybe....I'll just buy it on occasion. I need a local friend who brews it. That's my solution for everything really -- have friends with interesting hobbies that are different from mine! (like when we were living at the beach: don't go through the work of having your own boat....just have good friends who do). 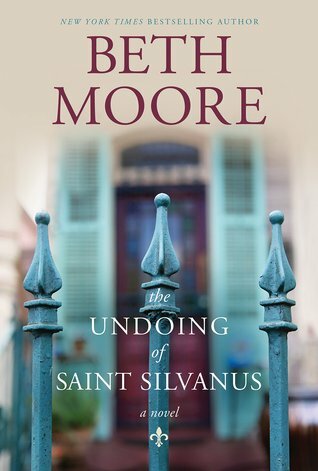 The Undoing of Saint Silvanus is Beth Moore's first foray into fiction, and I really enjoyed it. It's a little bit of a mystery, a little bit of a family drama, and a little bit of redemption story. It's set in New Orleans, and centers around the family and residents of Saint Sans, an old church turned boarding house/apartment house. Jillian, a young woman living and working in San Fransisco, gets a call from her estranged father's family letting her know that her father -- an alcoholic living for the most part on the streets -- has been murdered. Despite her mother's objections and her own misgivings, she heads down to New Orleans for the funeral. Jillian has a pretty big chip on her shoulder as the story starts. She's searching and lonely and subconsciously not really happy with her life (although she would tell you differently). The story and mystery and well-crafted, and the characters are a delight to spend time with -- even Jillian, as much as I wanted to smack her a few times. The real strength to this novel though, is the style. Beth tells the story like a classic Southern storyteller, rich in detail, sly commentary, and human observations. Bottom line: a really good read.